ARLINGTON, Va. (May 31, 2012) — Training in mental illness self-management with WRAP reduced depression and anxiety and improved self-perceived recovery over time for people with serious mental illness, according to research presented in the June issue of Psychiatric Services, a journal of the American Psychiatric Association. The Wellness Recovery Action Plan (WRAP), an illness self-management intervention involving education and peer support, is widely available across the United States and in several other countries for people with diverse mental health diagnoses. People typically develop WRAP plans as part of a WRAP group facilitated by trained peers recovering from mental illness and certified as educators. In a single-blind, randomized controlled trial Judith A. Cook, Ph.D., and colleagues looked at the effectiveness of WRAP in reducing depression and anxiety and in increasing self-perceived recovery among individuals with a serious mental illness. They found that compared with the control group, intervention participants reported significantly greater reduction in depression and anxiety symptoms and significantly greater improvement over time in total Recovery Assessment Scale (RAS) scores as well as the RAS subscales measuring personal confidence and goal orientation. In addition, the greater the number of WRAP sessions attended, the more participants’ outcomes improved. However, no differences were observed in recovery dimensions regarding reliance on others, willingness to ask for help, or symptom tolerance. The trial involved 519 individuals from six Ohio communities who were assigned to WRAP or to services as usual and assessed at baseline and at two- and eight-month follow-ups. 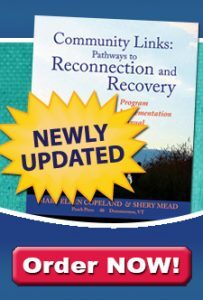 The intervention consisted of eight weekly 2.5-hour sessions delivered by peers in recovery from serious mental illness who were certified WRAP educators. “Our findings build on prior evidence of the positive impact of WRAP on recovery from serious mental illness and go further in demonstrating the longitudinal effectiveness of this intervention,” the authors conclude. In previous research, WRAP intervention has been shown to enhance hopefulness and quality of life and to increase knowledge about mental illness.